Llewellyn-Jones, Lloyd. 2017. 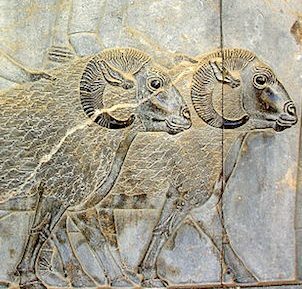 Keeping and Displaying Royal Tribute Animals in Ancient Persia and the Near East. In Thorsten Fögen & Edmund Thomas (eds. ), Interactions between Animals and Humans in Graeco-Roman Antiquity. Berlin, Boston: De Gruyter. The Achaemenid dynasty (559-331 B.C.) ruled the biggest empire the ancient world had ever seen. Commanding lands from India to Ethiopia and Libya to Afghanistan, the Great Kings of Persia demanded loyalty and tribute from the conquered peoples who made up their vast realm, and the walls of their ceremonial capital at Persepolis in the heart of Iran abound with images of foreign delegations carrying tribute to their monarch. Amidst the gold, silver, textiles and precious stones brought to the ruler is a rich abundance of exotic wildlife: Asiatic lions, Bactrian camels, zebu, wild asses, and Arabian horses. Textual evidence alerts us to the presence of parrots, peacocks, and wild jungle fowl at the Iranian court as well as the probability that the Achaemenid Persians were familiar with rhinoceroses, tigers, and even okapi. The exotic fauna were living offerings from the four quarters of the empire, breathing symbols of the Great King’s power and his control of his vast dominions. By examining a variety of Near Eastern and Greek sources, this paper explores the rich variety of exotic species imported into Persia to satisfy the monarch’s pleasure and his public image; it explores evidence for royal menageries in the Near East, as well as offering some cross-temporal comparisons with the Chinese Ming Dynasty, in order to question how the ancient Iranians interacted with exotic animals and to question how they were displayed and treated by their human captors and owners. Lloyd Llewellyn-Jones is a professor in Ancient History at the School of History, Archaeology and Religion, Cardiff University.